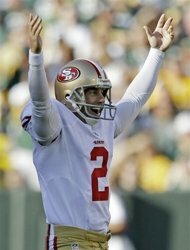 This past Sunday we saw the all time FG distance record tied for the second time in a year. And it wasn't indoors or even in Denver. I've previously written about how FG accuracy has improved even as attempt distances have increased., but even in the last few years kicking accuracy at long distances has improved significantly. This trend shows no sign of slowing, and it has significant implications for the sport. In 1974, the league FG% was 60.6%. This year, it was 84.5%. And that even masks how much kickers have truly improved. In 1974, 36% of all FG attempts were from 40 yards or beyond. In 2008, the figure was 41%. These days, teams aren’t looking to get inside the 25 for a field goal attempt, they’re just hoping to get inside the 40. Getting a quick score in overtime has become a far easier proposition. Field goals have gradually warped NFL football. In 1974, there were 3.0 FG attempts each game compared to 3.9 in 2008, a 30% increase. This isn't just a phenomenon of the '70s and '80s and it's not just due to the transition to the soccer-style kick. 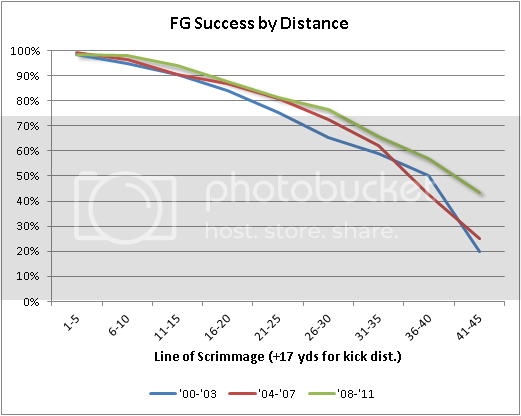 Since 2000, FG kickers have become more accurate, particularly at very long distances. The chart below shows FG success rates in three four-year mini-eras since 2000. The green line is for the most recent era, 2008-11. The red line is the middle era 2004-07, and the blue line is the early era 2000-03. The higher the line, the more often an attempt of each distance is successful. It appears that by the middle of the recent decade, FG attempts become more accurate in the middle distances, from about the 15-yard line out to the 30-yard line (32 yard attempt distances to 47 attempt distances). Then in the last four seasons, kickers became significantly more accurate at very long distances. This affects the game in at least two ways. First, it makes FG attempts more worthwhile at longer distances than they were before, meaning that punts and conversion attempts on fourth down become relatively less lucrative. Second, it becomes easier for offenses to score last second FGs to tie or win. They need less time and yards on their final drive to steal a win. Plus, this phenomenon creates a secondary effect. It means that teams with the ball and a small lead late in games should be less willing to give up the ball and trust their defense. As kickers improve, it becomes smarter to try to pass to covert first downs and keep the ball out of the hands of the opponents. The tactic of burning some clock with three runs into a brick wall followed by a punt is becoming less wise every day.